Australian children now have an annual spending power of $1.8 billion, up 13% from last year’s $1.6 billion, Cartoon Network’s latest study has revealed. The New Generations study found the average pocket money received by kids has also risen to $14 a week, up 27% since 2013. According to the study, Australian kids have significant influence over household purchasing. More than 90% of kids have influence over books, clothing, snack food and toys purchased. Kids also influence weekend activities and the kinds of family holidays taken. The top crazes and trend for girls aged four to 14 this year were loom bands, Frozen, Minecraft, Monster High and One Direction. For boys, it was all about Minecraft, Pokemon, Skylanders, Teenage Mutant Ninja Turtles and Lego. The study revealed seven in 10 parents agreed that advertising was a useful way to introduce new products to their kids and encourage them to try new things. Television remains the dominant entertainment and information source for children. The study revealed 85% of kids watched TV in the past month. “Television is the number one media for kids. Outside of their friendship group it is the most important media when it comes to how they find out about new things that appeal to them. This, coupled with the fact that the majority of kids spend time co-viewing with the household purchasing decision maker every week, means TV is still the most effective advertising medium for reaching this important decision,” Webb said. The study found 77% of kids went online at least once in the past month but are becoming increasingly mobile in how they access the internet. Almost a third (31%) of four to 14 year olds go online using a tablet device, while two in 10 use a mobile phone. About 14% of kids own a smartphone, up 8% since 2013. Video games remain the most popular online leisure activity for kids, followed by watching videos. Daily viewing has gone up 33% since last year with kids spending an average of 24 minutes watching videos online. “As tablet and mobile devices continue to proliferate homes, the way kids access entertainment and games continue to evolve. 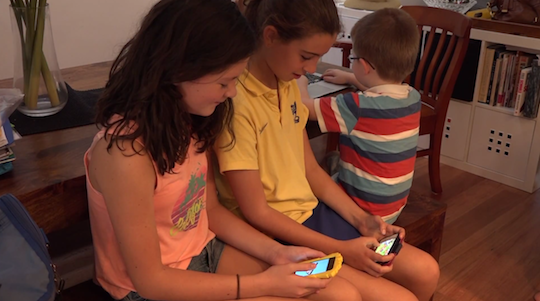 We’ve seen a significant shift in the amount of time spent watching online videos because of this, but playing games and the use of apps is still how kids choose to spend the majority of their online leisure time and there’s no indication that this trend will change,” said Webb.